Once again ¡MAYDAY! 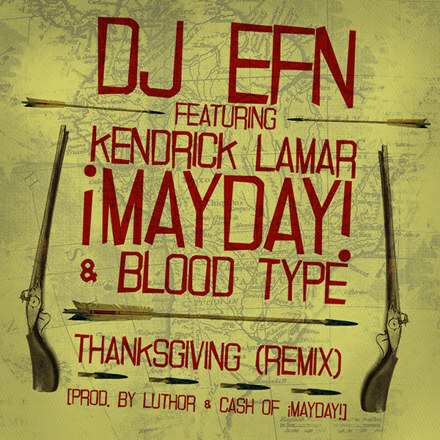 hits fans over the head with another dope collaborative effort, this time a remix of Blood Type’s “Thanksgiving” which also features a snarling verse from Kendrick Lamar. With pounding production from Plex and Cash of ¡MAYDAY!, the soulful sound of the original has been turned on its head with explosive results. Wrekonize and Bernz serve offerings to the Thanksgiving table as well, contributing a brand new chorus and a pair of flamethrower verses to match the remix’s new intensity. With all these dope ingredients coming together on a single track, the “Thanksgiving” remix is certainly something to be thankful for. Once again ¡MAYDAY! shows that not only do they roll with the best, but they make the best even better. Click HERE to download “Thanksgiving (Remix)” or listen below! What do you think of the song and ¡MAYDAY!’s production?